Spree, BITS Pilani Goa presents the events for Spree’18. Glory is no accident. It is the result of your hardwork, perseverance, learning, sacrifice and most of all it is about your love for what you do. This year, we give you the chance to attain your glory in 13 different events. 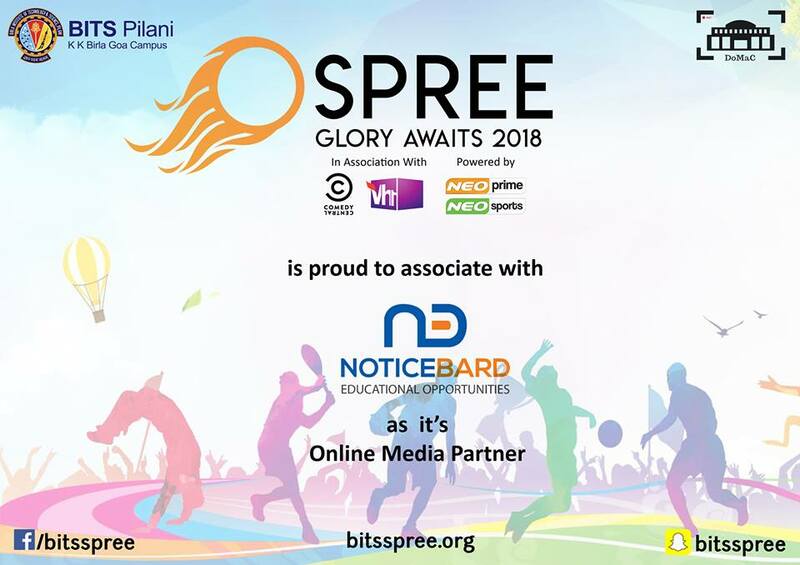 SPREE at BITS Pilani Goa is the biggest Inter-Collegiate Sports and Entertainment festival of India, organised with the sole aim of promoting sports and social interaction amongst colleges from India and abroad. “The champions prowl the arena, cautious and determined. They have sweated it out, pumped their iron, served their time in the training grounds. The wait is over. Their time to shine has arrived. Feel the adrenaline rush as they battle it out to crown the best of the best. This SPREE’18, Glory Awaits.”. For updates, follow this Facebook page and this Twitter page. Noticebard and Lawctopus are proud to be media partners for this event.